As discussed earlier, Yorkie is different from other dogs because it has hair, not fur. Hence, its owners are always keen for different hairstyles and haircuts. You should take great care while choosing the tools for hair styling/cutting. Inapt tools can cause itching and skin rash to your little buddy. Here we will let you know the best tool choices for your Yorkie. 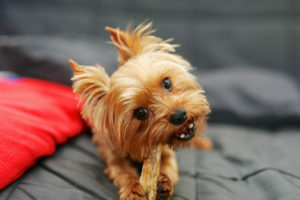 The wrong brush can turn Yorkie’s hair dull, frizzy and it can even hurt your dog. And the secret lies in perfect combing, brushing and spraying! The comb: Confused? Many of you do not know that you need to comb your Yorkie before brushing. The brush: To choose the best brush for your Yorkie you have to keep in mind a number of factors including, good quality pins, gentle and sharp pin-heads, reasonable strain and perfect size. The spray: A Spray may add-on to the beauty of your Yorkie. You have to consider factors like extra climate protection, prevent hair breakage and you should not forget to use the spray properly. The perfect time duration for brushing is between 10-15 minutes but needs more if a dog’s hair is tangled. Perfect time to brush your pup is right after giving him a bath; however, you may brush him whenever you feel tangled hair on his coat. For short hair pup you need to brush twice a week, and for long-hair Yorkie, you need to brush thrice a week. It is not necessary that you buy an expensive brush. There are organic brushes, which comes in a cheap bargain. However, you have to change them more frequently, as the pins become inefficient and dull after a short period of time. Lastly, you have to take care of your Yorkie’s comfort and mood. You have to find out the time when he is peaceful and calm, only then he will be able to enjoy the brushing routine.